The police tactic resulted in "serious injury" for two motorcyclists. A controversial tactic in which police in London use specially-trained drivers to ram criminals on scooters has triggered two separate investigations after the criminals had suffered “serious” injuries. The Metropolitan Police released footage last month of the policy, known as “contact tactics,” in action. The aggressive tactic is used in the hope that "potential offenders will think twice about their actions," the department said in a statement. Police are legally obligated to make a referral to the Independent Office for Police Conduct (IOPC) if an individual is “seriously injured” during a police operation. This automatically triggers an independent investigation. The findings of an IOPC investigation are then sent to the police force -- which is then required to act on the recommendations. 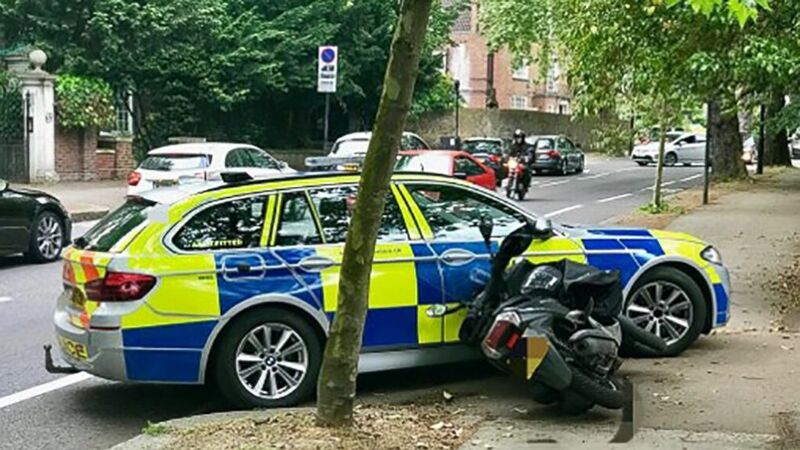 (Metropolitan Police) Moped and motorcycle criminals will be targeted "at every opportunity," even when they ride dangerously, discard their helmets and disguise themselves, London's Metropolitan Police have said. The first investigation was launched after a “contact tactic” incident in November 2017 left the driver of a scooter with a head injury and a broken foot. Then, in March, another scooter operator involved in an incident ended up with a broken leg. Both injuries were deemed significant enough to be “serious,” an IOPC spokesperson told ABC News. Knocking people off bikes is potentially very dangerous. It shouldn't be legal for anyone. Police are not above the law. The IOPC said the officer involved in the November incident breached professional standards. The investigation could now result in criminal charges against the officer. “Ultimately no police tactic can ever be used with impunity in a country where we police by consent – be that tactical contact, the use of firearms or the use of restraint,” an IOPC spokesperson told ABC News. The duel investigations are likely to bolster the argument of those opposed to the controversial policy. Ultimately no police tactic can ever be used with impunity in a country where we police by consent -– be that tactical contact, the use of firearms or the use of restraint. It is always a matter of whether it’s reasonable and proportionate in the circumstances. Independent scrutiny is a vital part of public confidence in the way policing is done. Police, however, say that such tactics are necessary and play a part in reducing crimes committed on motorbikes. “We are pleased to see a reduction in moped-related offenses and we will continue to work tirelessly across London to maintain this downward trend,” a spokesperson for the Metropolitan Police told ABC News. “Tactical contact has long been available to officers, however it is now being used more frequently in the Met’s fight against power two-wheeled crime. The proportionate use of force is essential in circumstances where officers have to protect the public and often themselves." A pillion passenger is a term mostly used in the United Kingdom to describe a second passenger on a motorbike.